Questions? 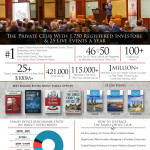 We interact with over 40,000 professionals year, over 25,000 professionals have attended our 100+ conferences and workshops hosted over the past 11 years, and every day our almost 20 person team is answering questions regarding the family office industry, capital raising/investor relations + the Family Office Club. Instead of writing out 100 FAQs here we are going to just list the top 7 questions we get and our answers so that even if you have not thought of these questions yet they may be helpful to you in getting to know us and our platform. If you just want to get help right now you can chat with us through this website or call us during Eastern Time hours at (305) 503-9077, email us at [email protected] or schedule a call with Adriana on our team using this scheduling link. 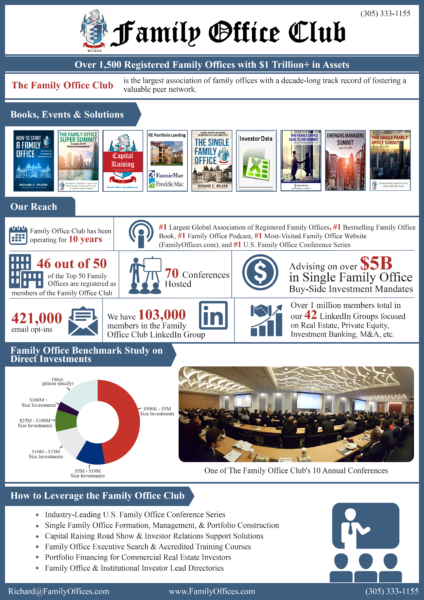 Question #1: How does the Family Office Club work? We are a community of investors and investor relations professionals who work with family office clients. Through providing more thought leadership than all of our competitors combined via our Family Office Podcast, Family Office Monthly Newsletter, Blog, Youtube channel, email updates & free book, bestselling books on Amazon here and here, and live events we have a model of giving away knowledge and best practices as often as possible to build new relationships in the industry. 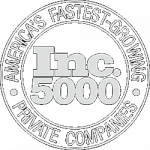 We work with both ultra-wealthy families and single family offices directly as well as those who are raising capital. On the capital raising/investor relations side of things we offer Charter Membership which includes our online portal, investor relations tools, over 300 recorded investor interviews, and 20 live summits and workshops a year to attend in person. Question #2: How do you work directly with wealthy families and family offices? We help ultra-wealthy families build out and create their single family offices, help formalize single family offices, and help single family offices operate more effectively through helping them create dashboards, deal strike zones, upgrading solution providers, and helping manage their monthly pulse updates, and quarterly meetings. We are often asked to help with and often investors speak at our Family Office Club investor events to source more and higher quality direct investment deal flow as well. 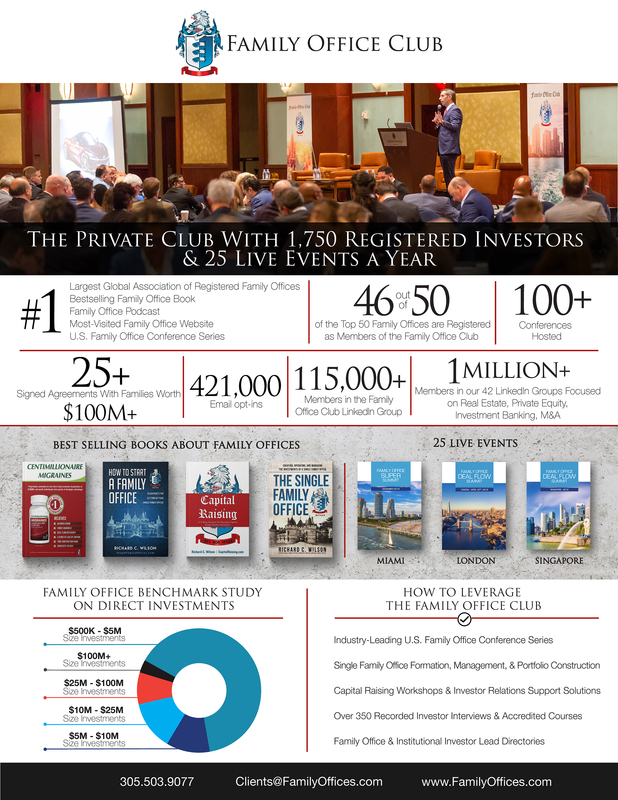 We currently represent 25 families under contract who are worth over $100M each and we have well over 600 family offices and private investors attending our events each year with several hundred of those featured on stage at our live investor summits. Question #3: Where should I get started if I’m just learning about the Family Office Club and this whole industry? We recommend doing two things to get started, first schedule a call with Adriana Diaz on our client team using this link, and second please download a free copy of our book here. Question #5: Can you help me raise capital or get investor meetings? There are 1,000’s of placement agents, third party marketers, and brokers who make their living raising capital for investment and asset management companies, that is not our business model. Our goal is to help the firm principal, capital raiser, or a placement agent and be a catalyst for them to develop more investor relationships and raise more capital by providing value where brokers and placement agents do not. We add value through our thought leadership, insights, best practices, capital raising models to implement, investor directories of contact details, fast-paced investor relations workshops, 10 live investor networking summits per year, and over 300 recorded investor interviews now available to stream within the Charter Member portal. Our members get their investment marketing materials reviewed quarterly, free lifetime access to our CRM, a public listing on our website, capital raising coaching at our workshops and more. Question #7: What is a Family Office? A family office is a holistic often full balance sheet approach to managing and overseeing the wealth and financial affairs of ultra-wealthy families. There are three basic types of family offices, virtual family offices, single family offices, and multi-family offices. A virtual family office, most often used by those with $20M-$500M in net worth is a very leanly operated small team of typically 1-4 professionals who only keep investment activities in-house that they believe they are world class at or is in the field where they created their wealth or expect to be able to create additional value most. 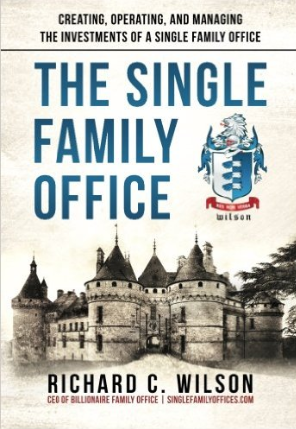 A single family office, most often used by those with $300M-$1B+ is similar to a virtual family office but typically will employ 5-15 professionals and sometimes more with some having 100+ person teams, every part of the single family office is built to manage the wealth of a single individual or family and it can include overseeing insurance, philanthropy, multi-generational planning, regulatory concerns, taxation, legal structures, due diligence on investments, deal flow, and anything else that may significantly impact the balance sheet of the individual or family. Typically every single family office has some tasks done in-house while also outsourcing some things which are not productive to do in-house such as software programming for custom reporting, or forensic accounting due diligence. Another way to think about it is that a virtual family office is a single family office which relies heavily upon outsourcing almost everything while a single family office typically keeps more things in-house and has a more balance approach. The final and third type of family office typically referred to is a multi-family office, typically used as the core family office solution for those with $10M-$50M net worth this is most easily thought about as a more holistic, more long-term minded wealth management firm which is typically very strong on taxation and multi-generational planning. Some multi-family offices are far more holistic and full balance sheet than others, but the ideas is that if a firm is dedicated only to serving the ultra-wealthy they will be familiar with their challenges and typical tools and solutions they need. I also defined what is a single family office in a video 5 years ago in Prague which you can view here. If your question was not addressed here please try to chat with us now if it is during Eastern Time business hours or reach out to our team at [email protected] and we always do our best to reply back within 1 business day.